Memorial to civilians and servicemen killed in World War I; 1921, by Philip B. Bennison. Limestone, ashlar and rockfaced. Raked, stepped plinth to square, coursed, rockfaced pedestal with ashlar quoins at angles, roll-moulding at base and chamfered cornice. Square shaft supports a further pedestal, with chamfered plinth and cornice, surmounted by a draped bronze figure of Triumphant Youth. The four faces of the uppermost pedestal bear sculptured bronze achievements of arms, the seal of Hartlepool and a cartouche dated 1914. The east face of the shaft is inscribed: "FOR US THEY DIED"; west face: "LIVE THOU FOR ENGLAND". 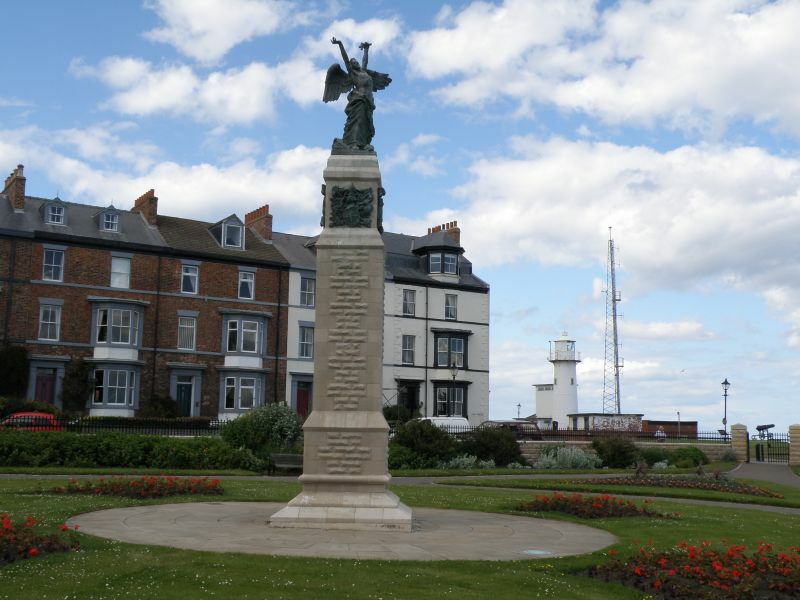 This List entry has been amended to add sources for War Memorials Online and the War Memorials Register. These sources were not used in the compilation of this List entry but are added here as a guide for further reading, 10 August 2017.